1　Konfession und Gesellschaft in einem Gewerbezentrum des frühneuzeitlichen Deutschland: Das Wuppertal (Elberfeld-Barmen) von 1650 bis 1820. ６　Interdisciplinary Perspectives on the Origins of the Japanese. Regional customs in Japan and regional identity in Germany: From the dual structure model to comparative socio-economic history. International Research Center for Japanese Studies. The Eleventh International Symposium. 18　Local Realities and Environmental Changes in the History of East Asia. Livestock and the 'Industrious Revolution' in Tokugawa Japan. Ts'ui-jung Liu (ed. ), Abingdon: Routledge. Pp.27-48. 19　Integrated Peasant Economy in a Comparative Perspective. Alps, Scandinavia, and Beyond. Disaster Management and Integrated Economy in Early Modern Japan. Amakusa in the 19th Century. A. Panjek, J. Larsson and L. Mocarelli (eds. ), Založba Univerze na Primorskem, Koper 2017. Pp. 241-266. ８　Regional differences in the age at marriage: A comparative analysis of early modern Germany and Japan. 10　Regionalismus in der Geschichte der Familie. Die Frühneuzeit in Japan und Deutschland im Vergleich. 13　Regional standardization in the age at marriage. A comparative study of pre-industrial Germany and Japan. 23　Determinants of Inheritance Patterns in an Early Modern Japanese Village, Yukinobu. Historicka demografie 31/2007. Pp. 91-116. 25　Smallpox Quarantine Huts in 18th and 19th Century Amakusa Islands, Kyusyu, Japan. Physical History Research Project Working Paper No.2. 11 pages. 30Seashore Villages in Amakusa: Takahama and Sakitsu. A Comparative Study of Population Registers and Disaster Management in the 19th Century, Kyushu, Japan. 33　Work hard as a family business in a peaceful and calm village in early modern Japan. 14　国際研究集会発表：Regional customs in Japan and regional identity in Germany: From the dual structure model to comparative socio-economic history. 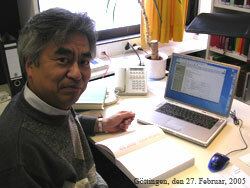 20　国際学会発表：Regional differences in the age at marriage: A comparative analysis of early modern Germany and Japan. 21　海外講演：Schwierigkeiten zu heiraten, oder freiwillig alleinstehend? Das Unverheiratetsein als ein Lebensstil im Deutschland der Frühneuzeit. 22　海外講演：Japan Ost und Japan West. Geschichte eines regionalen Konfliktes. 23　海外講演：Japan Ost und Japan West. Geschichte eines regionalen Konfliktes. 28　国際学会発表：Transnational networks of Calvinism in early modern Europe. A German reformed church in Elberfeld in and after the period of ‘Confessionalization’. The Third European Social Science History Conference. Amsterdam, the Netherlands. The Fourth European Social Science History Conference. The Hagude, the Netherlands. The 27th Annual Meeting of the Social Science History Association, St.Louis, USA. 35　国際学会発表： Family property in a German pre-industrial community. An economic transition. The 28th Annual Meeting of the Social Science History Association, Baltimore, USA. 37　国際学会発表： Inhabitants in comparative perspective. Religious registration and population register. The Fifth European Social Science History Conference, Berlin, Germany. 39　国際学会発表：The Thirty Years War and a change of marriage pattern in a reformed church in Germany. The 29th Annual Meeting of the Social Science History Association, Chicago, USA. 42　国際学会発表：Determinants of inheritance patterns in Japanese preindustrial societies. The 20th International Congress of Historical Sciences (CISH), Sydeny, Australia. 43　国際研究集会発表：Zwischen dem neuen Steuerstaat und der mittelalterlichen Tradition: Der Beitrag einer bürgerlichen Advokatenfamilie zur Gründung des Stadtgerichtes in Elberfeld von 1708. Staatsbildung von unten: Europa 1300-1900. 44　国際学会発表：Marriage market in a comparative perspective. The 30th Annual Meeting of the Social Science History Association, Portland, USA. 45　国際学会発表: Smallpox quarantine houses in 18th and 19th century Amakusa Islands, Kyusyu, Japan. The Sixth European Social Science History Conference, Amsterdam, the Netherlands. 47　海外講演：Japonská žena v období raného novověku (= Lebensläufe der japanischen Frauen in der Frühen Neuzeit). 49　国際研究集会発表：A Polluted Island in the Inland Sea of Japan. 53　国際学会発表: Poor Households in the Wupper Valley, a Proto-Industrial Region in Germany, 1663-1673. The Seventh European Social Science History Conference, Lisbon, Portugal. 54　国際研究集会発表: Historical Change of Water Management in International Perspectives. The Second International Joint Symposium for the Establishment of Sustainable and Recycling-based Society, Takamatsu, Japan, October 16th, 2008. 55　国際研究集会発表: An Intellectual History of Water Culture: Environment and Development. The First International Workshop on Water Culture and Distance Learning: Europe, South-Asia, and Japan, Takamatsu, Japan, November 5th, 2008. 56　国際研究集会発表: Reservoirs and Ponds in Sanuki, Kagawa, Japan. 57　国際学会発表: Smallpox and Population Change in 18th and 19th Century Amaku-sa Islands, Kyushu, Japan. IUSSP Seminar. Demographic Responses to Sudden Economic and Environmental Change, May 21-23, 2009. Reitaku University, Kashiwa, Chiba, Japan. 58　国際学会発表: A Transnational Intellectual History of Water Culture in Japan: Meiji Restoration, Hounenmultiple-arch dam and Typhoon Isewan (Vera). The First World Congress of Environmental History. August 4-8, 2009. Denmark-Sweden. 59　国際学会発表: Smallpox and Quarantine Policy in 18th and 19th Century AmakusaIslands, Kyushu, Japan. The 14th International Conference of Historical Geographers. 23–27 August 2009. Kyoto, Japan. 61　国際研究集会発表: Seeking a Community-based Environmental Education Module: Water Culture in Japan and Germany in Comparison. The Second International Workshop on Water Culture. Ceske Budejovice, Czech Republic, December 2, 2009. 62　国際学会発表: A Seashore Village, Sakitsu. A Comparative Study of　Population Register and Disaster Management in the 19th Century, Kyushu, Japan. The 8th European Social Science History Conference, in Ghent, Belgium, 13 April - 16 April, 2010. The First Conference of East Asian Environmental History (EAEH2011), Academia Sinica, Taipei, Taiwan, October 24-26, 2011. ICHG, Prague, the Czech Republic. Lecture at the Rachel Carson Center, Lunchtime Colloquium, Munich, Germany. September 12, 2013. The Tenth European Social Science History Conference, Vienna, April 23-26, 2014. 73　国際研究集会発表: Village network and disaster management in early modern Japan. 74　国際研究集会発表: Environmental topography for the future: Registration of nature, culture and humanity. The Water Crisis Symposium at Kagawa University, Takamatsu, Japan. 75　国際学会発表: Village network and disaster management in early modern Japan. Amakusa in the 19th century, Japan. ICHG 2015, Royal Geographic Society, London, England. 76　国際学会発表: Village networks and economic inequality in early modern Japan. WEHC 2015, Kyoto International Conference Center, Kyoto, Japan. 77　国際学会発表: Geographic expansions and demographic changes by smallpox disasters in 18th and 19th century Amakusa islands, Kyushu, Japan. 78　国際学会発表: Early modern economy in interaction with nature. Village network and disaster management in Japan. EAEH 2015, Kagawa University / Sunport Hall Takamatsu, Takamatsu, Kagawa, Japan. 80　国際研究集会発表: Disaster management and integrated economy in early modern Japan. Amakusa in the 19th century, Japan. International workshop on "Integrating Income Sources in Peasant Economies: Evidence and Research Questions from Slovenia, Italy and Japan" (2016/2/26), 2016/2/26, University of Primorska, Koper, Slovenia, Oral (Invited). Research Institute for Mathematical Sciences, International Seminar, Kyoto, Japan, 2016/10/31-11/1. 84　国際研究集会基調講演: Living spaces: Local narratives, regional clusters, and communal movements. International Workshop on Living Spaces under Changing Climate and Environment, North Eastern Hill University, Shillong, Meghalaya, India, 2016/11/7-9. Keynote Speech. 85国際学会発表: Living spaces in Japanese historical demography and topography: Linking pre-statistical family demography to "People Flow Data" clustering. International Seminar on Linking Past to Present: Long-term perspectives on micro-level demographic processes, Kashiwa, Japan, 9-10 December 2016, Seminar organized by the IUSSP Scientific Panel on Historical Demography and Reitaku University. 86国際学会発表: Farmers’ household and ’Living Spaces’ during and after the Industrial Revolution: Otagi, Kyoto, Japan, 1880-1908. 2017 Agricultural History Society, Conference Basics, Grand Rapids, Michigan, June 8-10, 2017. 87国際学会発表: Disaster management and integrated economy in early modern Japan. Amakusa in the 19th Century. Rural History 2017, September 11 (11-14), Leuven, Belgium, 2017. 88国際学会発表: Changing locality in the age of the Anthropocene in Japan? EAEH 2017, Jinnan campus of Nankai University, Tianjin, China. October 28 (26-31), 2017. 89国際学会発表: An environmental history of village size in early modern Japan: Otagi, Kyoto. EAEH 2017, Jinnan campus of Nankai University, Tianjin, China. October 30 (26-31), 2017. 90　国際学会発表: Mortality transitions in Bangladesh since 1990: Kanchanpur Union at Tangail District. ESSHC 2018, Belfast, Northern Ireland, UK, April 6 (4-7), 2018.